Liberace is one of the great talents I wish I had seen, along with Elvis. I remember when I was 6 years old I believed I would see Elvis in concert one day, but no, dreams don't always come true. 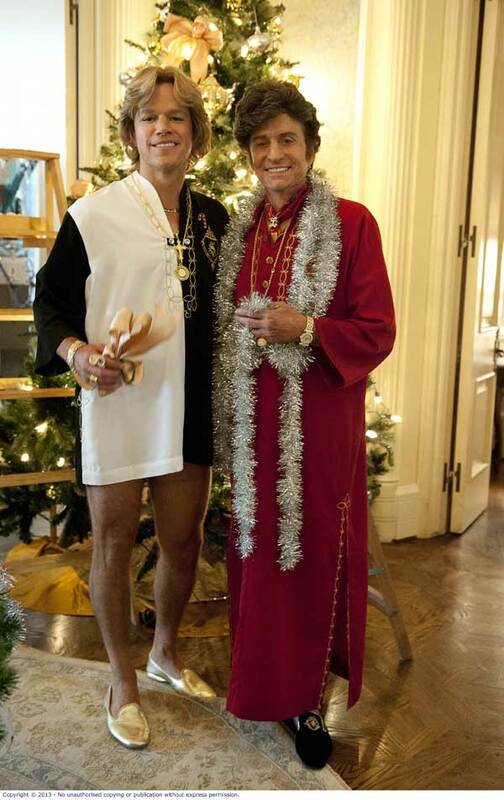 I was excited to get an invite to BEHIND THE CANDELABRA and keen to wear my new jeans to the film preview, but I thought, "Liberace, hmmm, will it call for something a little more glamourious?" He was a fancy dresser. I remember there was always a bit of gold thread and bling even when he wasn't wearing his $300 000 fur coat with crystal studded train. But being engrossed in a movie, in a dark cinema, I'm bound to end up wearing half of my Choc Top, so the fake-fur stayed at home and the jeans won, I just dressed them up with a Dolce & Gabbana inspired shirt, with Chinese collar, and gold sand-shoes and yeah, I think I got it right on the night because check out the cute couple in the gold pumps below.